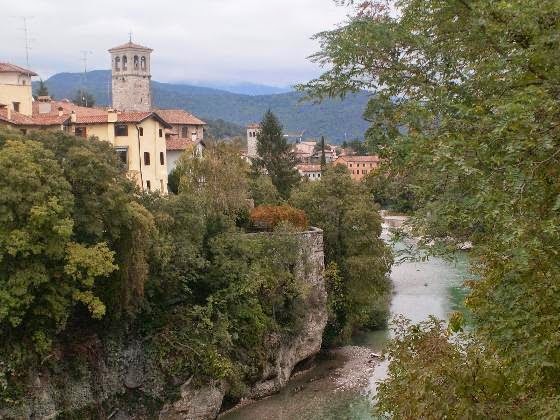 CHIAVARI, Italy - This week Auntie Pasta heads to Friuli Venezia Giulia, a mountainous region in northern Italy this is bordered by Austria, Slovenia and the Adriatic Sea. To say that Friulian cuisine is totally disconnected from the cuisine from other parts of Italy, is putting it mildly. What there is is a strong Austrian and Slavic influence, not just in the cooking of Friuli, but in the lifestyle as well. The reason why is simple. Before this area had any connection with Italy, it was part of another empire that stretched from Bohemia to the Balkans, and within that empire there were many diverse ethnic groups and a number of languages ​​and cultures. That’s the why you will find sugar, cheese, butter, fruit, jam and mustards all tossed together wily nily in all kinds of dishes, from pasta to desserts. The typical example of this mix are the "cialzons of Arthur", a type of raviloli. The dough is a normal, simple ravioli dough made from flour, water and salt. The filling, however, reads like a grocery list. The traditional recipe calls for a mixture of boiled potatoes, chopped apples and pears, cookie crumbs, parsley, mint, lemon balm, basil, marjoram, verbena, raisins, smoked ricotta, dark chocolate, plum jam, sugar and cinnamon. 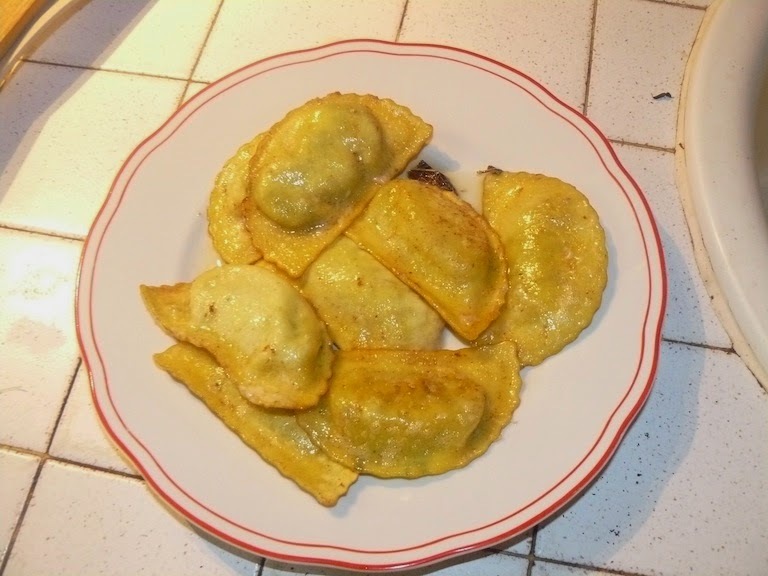 After the cialzons are cooked like normal ravioli, boiled in water, they are served with melted butter and a sprinkle of cinnamon, sugar and plenty of grated smoked ricotta. The Friulani are also very fond of Boreto Gradesana, their traditional fish soup. But unlike other Italian fish soups, this one is made without tomatoes. Not that the Friulani don’t like tomatoes, it’s just that this recipe is so old, it was developed before the tomato was introduced in Europe. 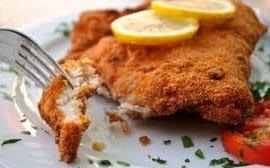 Also, I don’t you will find a recipe for fried chicken like this one anywhere else in Italy either. The crispiness comes from the chicken being double dipped, first in batter and then in egg before it’s fried. Wash the chicken under running water and then place them in a bowl. Add salt and pepper and the juice of one lemon. Let marinate for about 5 minutes. While the chicken is marinating prepare the batter. In another bowl, beat three eggs with a fork. Add a little pepper, the breadcrumbs and the grated Montasio cheese and mix until the mixture is smooth. In another bowl (this is bowl number 3) beat the remaining egg and set aside. Remove the chicken pieces from the lemon marinade, pat dry with paper towels. Dredge the chicken pieces in flower, dip them into the egg batter and then into the beaten egg. Heat a good amount of oil in a deep frying pan. Over medium heat, fry the chicken pieces until well browned. Then turn them over (use a slotted spoon) and cook them for about twenty minutes, turning them occasionally. When they are cooked, remove from heat and place on paper towels so excess oil is absorbed. Serve immediately. Friuli is home to Montasio cheese, a mild cow’s milk cheese that tastes a little like Swiss cheese or Asiago. 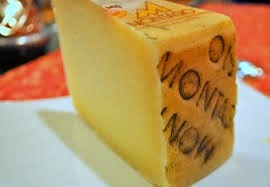 Montasio cheese was first made back in the 1200’s by Benedictine monks living Friuli. The cheese was recently awarded the Italian DOP label, which defines its geographic area and lets you know you are getting the original product. There are three types of Montasio: the most mild and most creamy is Montasio Frescoor; Montasio mezzano is aged a little longer, which makes it a little less creamy with a golden color; and Montasio stagionato or Montasio stravecchio, which is aged the longest and must be grated. While Montasio may not be as well known as Parmesan, you can use it the same way. Grate it over pasta, added to risottos, or chunk it off and eat it as an appetizer. It is also the cheese of choice for making frico, or fried cheese. 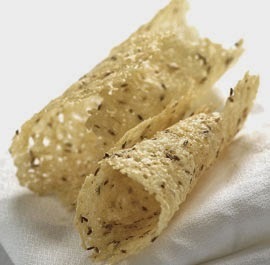 Cheese crisps can be made one by one in a nonstick saute pan, or in batches on baking sheets in the oven. The idea is to just sprinkle enough cheese so that it melts and creates a texture that's lacy but still holds together. Here is the oven version. Serve as an appetizer or with a green salad. 1. Combine cheese with flour in a medium bowl. Mix thoroughly. 2. Lightly grease a large cast-iron skillet with extra-virgin olive oil, then place over medium-low heat. Spoon 2 tbsp. of cheese onto heated skillet for each 2''–3'' round. Allow cheese to melt and edges to turn golden brown. Cook, without touching, for about 3 minutes, then turn with a spatula (when ready, frico should come away easily from pan) and continue cooking for 2 minutes. 3. Drain on paper towels. Repeat with remaining cheese. Serve at room temperature.